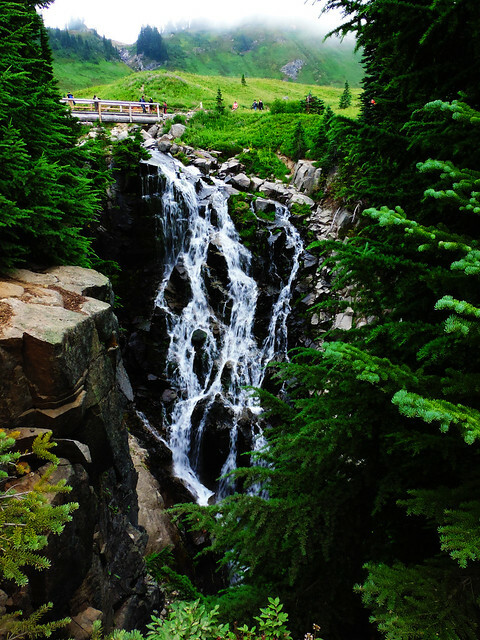 We had a one day road trip in Mount Rainier as part of a two weeks road trip through US national parks. That one day was definitely not enough for anything. And even during that one day it was dense fog all day. 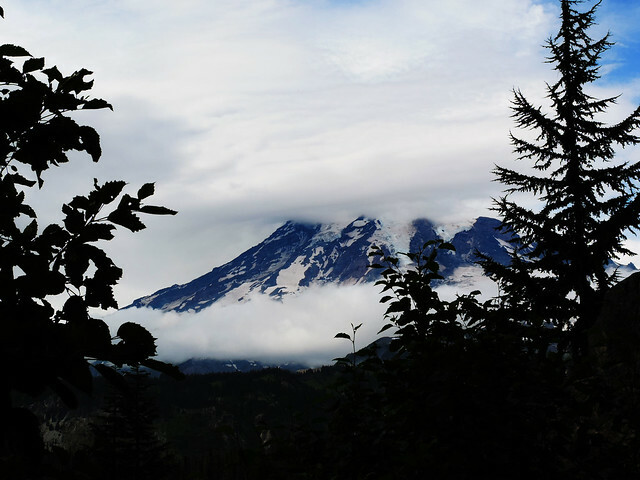 It meant that we couldn’t see the snowcapped peak of Mount Rainier nor any other high peaks – only for 10-20 minutes around noon. 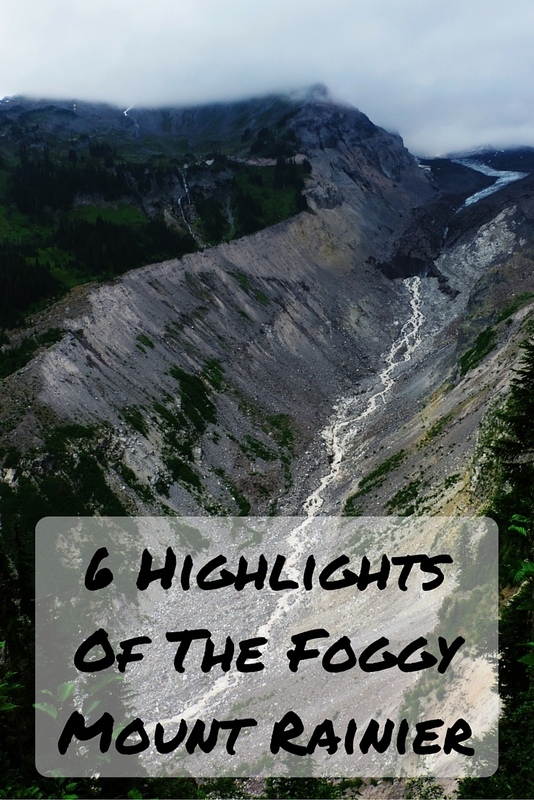 What to see if you can’t see anything in the fog? So we decided to give up on the planned scenic hikes as we couldn’t see any panorama in the fog. Still we ended up having a wonderful day. We did a short road trip in the Longmire and Paradise areas of the park, stopped at awesome waterfalls and did a few nice short hikes at lower elevation. We entered the park at Longmire and our first stop was Christine Falls which is right by Paradise Road – actually, it’s under the road and there’s a little bridge over it. You could park in the pullout after passing the bridge and the waterfall is really just a couple of steps from there. 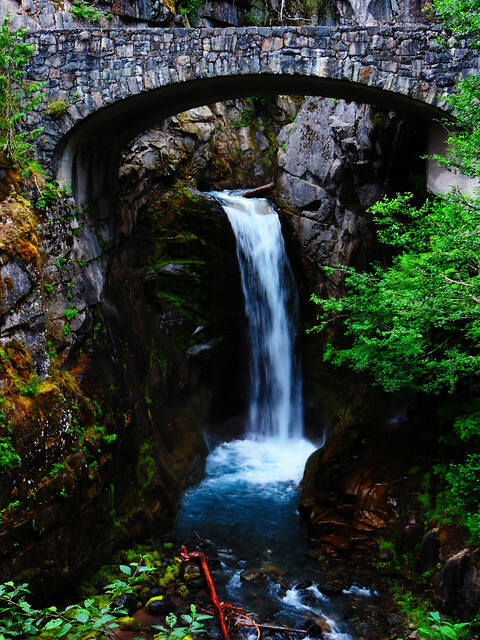 Continuing on Paradise Road our next stop was charming Narada Falls. 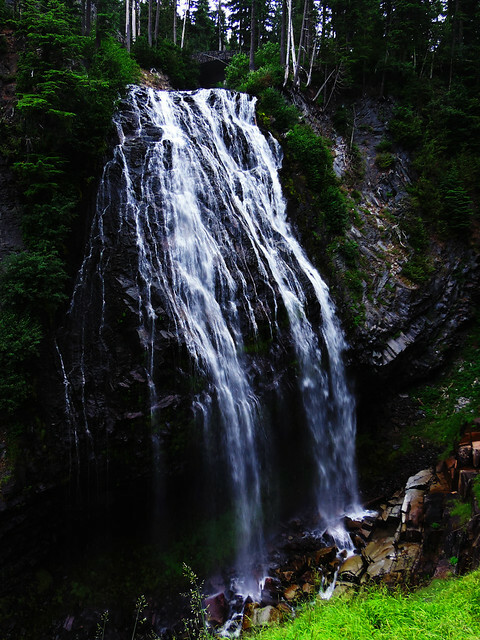 To get the best view of the falls, you need to take a very short, but steep trail. After taking a turn towards Henry M. Jackson Visitor Center, our next stop was Nisqually Vista Trail. 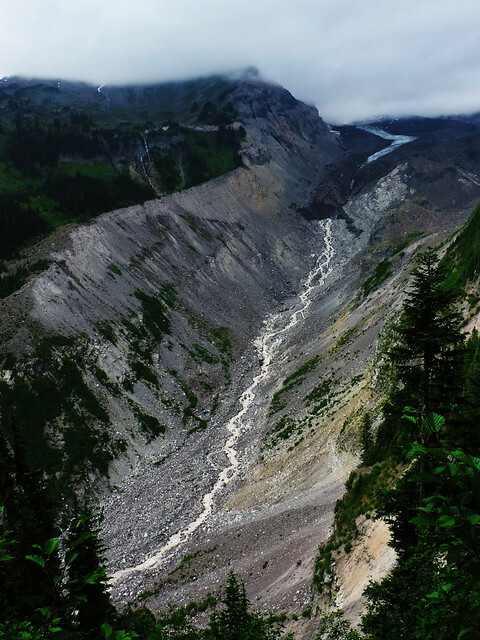 This 1.2 mile loop rewards you with stunning views of Mount Rainier and the Nisqually Glacier. Though we couldn’t see anything of Mount Rainier because of the fog, we still had a nice view of the lower part of Nisqually Glacier. This charming waterfall is in walking distance from the Nisqually Vista Trailhead and it’s just 0.4 mile walk on Skyline Trail from Paradise Inn. 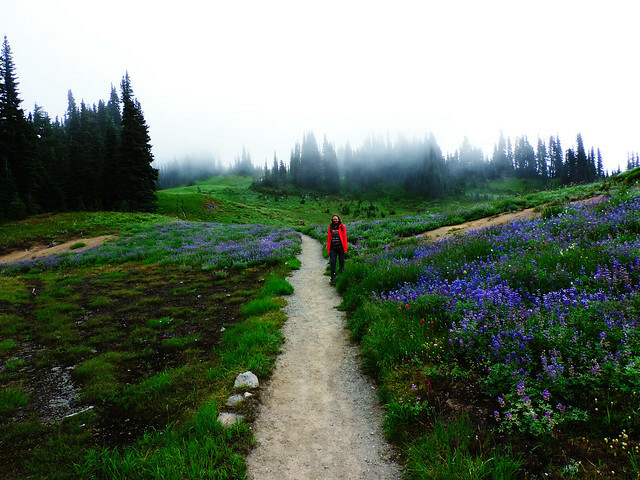 Plus we’ve seen a variety of wildflowers even on that short section of Skyline Trail while we got to Myrtle Falls. Reflection Lakes got its name because these lakes reflect Mount Rainier – of course, they can only reflect it if it’s visible which was not true in our case. But there’s a trail called Lakes Trail starts from these lakes and leads up to Paradise Glacier Trail. It has nice views of the Reflection Lakes and the meadows on your way are full of wildflowers in the summer. It’s about 6 miles round-trip, but we only went up to the point where the fog was not so dense. This 2.5 miles round-trip is at a lower elevation and it led us to two beautiful lakes. We also had nice views of the lower peaks. 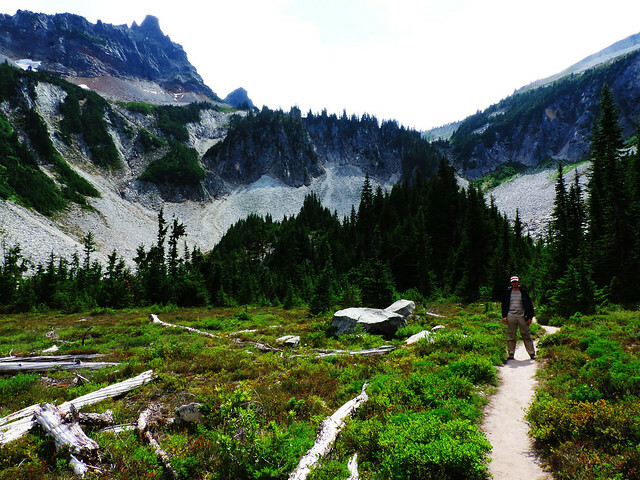 Do you have a favorite trail in Mount Rainier? Mt. Rainier does not disappoint. We like Sunrise visitors center the best for less crowds and great starting point for many beautiful hikes. Go up to crystal mountain about 40 minutes north and take the gondola to the top in summer. 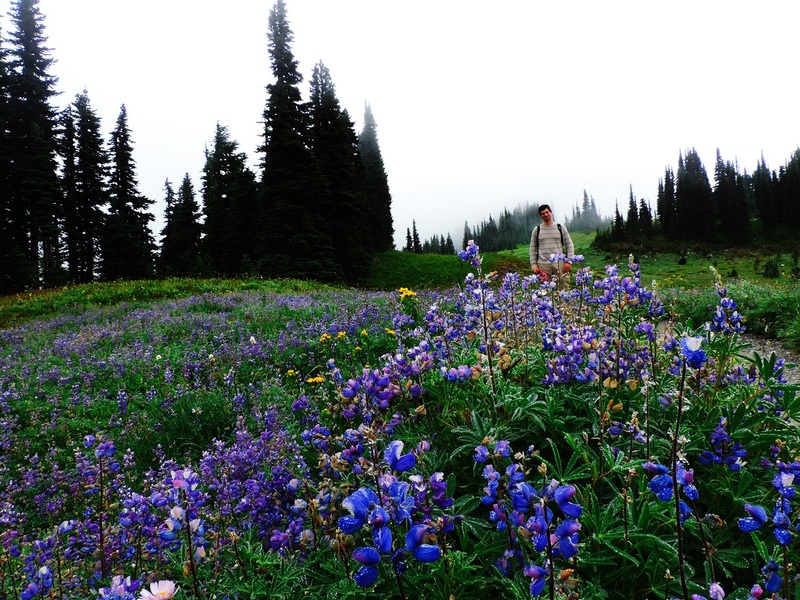 Don’t miss easy hike around Lake Tipsoo for wildflowers in August. Also summerland trail and the Burroughs trail. Hey Mark, thanks for the great tips!